Lots more fun with Jennifer Haley today, but first, the legal mumbo-jumbo: There are two pressing evidentiary issues that are still being hammered out, but the prosecution has been making some serious headway on getting excluded evidence admitted. One is the previously discussed recording of Kirby Brown describing her experience of the Samurai Game. The issue for the defense is that they cannot cross-examine a dead woman -- not with the current technology. The prosecution has successfully worked its way around this by positioning this recording as evidence of what James Ray knew and his state of mind rather than "for truth." Darrow's ruling will allow the recording in specifying that it must be played in its completeness, rather than the small excerpt the prosecution had submitted. And it will have to be presented with a "limiting instruction." 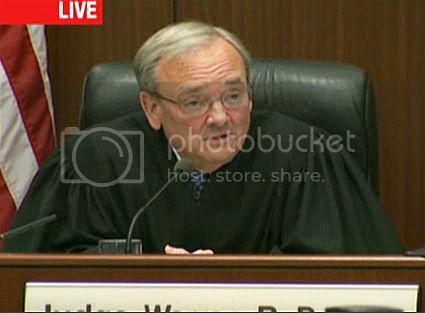 The other major success for the prosecution is that Judge Darrow has agreed to allow testimony regarding prior events on the basis that it goes to causation. There is still a lot of wrangling over this as to how much and what of this testimony will be admitted. The history is important for a number of reasons. One is that it makes it much harder for Ray to claim ignorance of the health dangers because there have been incidents at past sweat lodges, including a 911 call and hospitalization. After problems in 2005, Ray dialed the heat in his sweat lodge way back in 2006. Then, in 2007 he started ratcheting up the heat again so that it got hotter every year. It could be argued that he grokked the risk after 2005 because he responded to it by lowering the heat the following year. But he later disregarded his own concerns because he started ratcheting up the heat again. That's not ignorance. That's willfully disregarding a known threat to the health of participants. That distinction could, arguably, be the difference between recklessness (manslaughter) and negligence (criminally negligent homicide). The state also plans to argue that the sweat lodge history refutes the defense's argument of poisoning as the putative cause of death. Both the prior sweat lodge structure and the later, larger one, built to Ray's specifications, were used by other groups who used the Angel Valley facility. 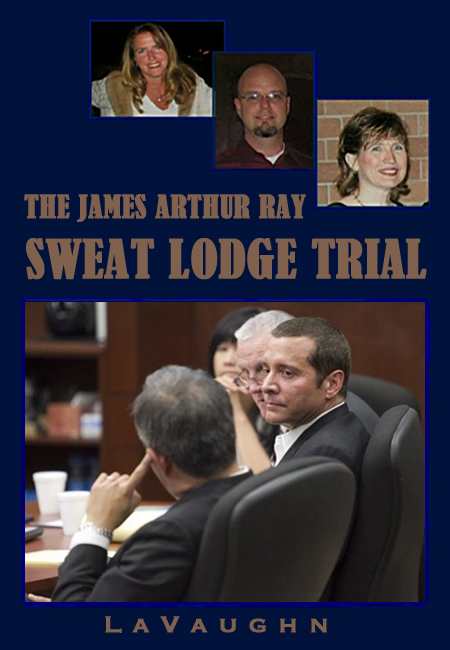 The prosecution will argue that the only health problems occurred during James Arthur Ray's sweat lodges. So if the blankets were leaching rat poison into the air, they were doing so very selectively. In the beginning of her testimony today, Haley addressed something that I had wondered about regarding her Dream Team role as head shaver. Haley is a licensed cosmetologist and, as such, has regulations to follow in terms of sanitary conditions and hair cutting instruments. Full disclosure: I went to cosmetology school and was licensed at one time. So a number of things bothered me about her testimony yesterday. One is that, as I said, clipper cuts are something you learn in barber school, and not part of any standard cosmetology curriculum with which I am familiar. As she said, she had never done a clipper cut, except on her dog, and was very nervous about it. But worse than that, I was concerned about the conditions under which she was doing this and how sanitary the instruments could have been. Especially considering that Ray demanded she remove the guard and risk nicking, scraping, and burning the scalp. Because at that point you're talking about the risk of infection and very close to the brain. From her testimony today it's clear that this concerned her as well but that she deferred to Ray's demands. Ray's views on vegetarianism are certainly debatable but the point is that he believed depriving people of animal protein would leave them at a disadvantage. Haley also testified about the lack of sufficient sleep during the course. She quotes Ray as having told participants, "You'll sleep when you're dead." Could you take this home, this list home and work on it at home. No or yes? Will you most probably? [Without pausing for them to answer, he answers for them] No. So guess what? You've got four days now 'cause this day's over, almost. You have five nights and four days to get your work done. And so, you have to choose at how, at what depth and what intensity you're gonna play. You have choose what impeccability really means for you. Let me tell you something. You're going to a battle that you were born to fight. It's the biggest battle and you probably will not survive. And so, as a Samurai, what you want to do is be as clean as you can be before you exit this body. Because whatever you exit this lifetime with, you take into the next. [long pause] So you have tonight and you might have tomorrow. Who knows? The battle might be tomorrow. You have to choose at what level you're gonna play. And let me tell you something. You invested a lot of time, and a lot of money, and a lot of energy to be here. And if it were me, I wouldn't go to bed tonight. I'd be workin' because the battle might be tomorrow and I wanna go out of this lifetime as clean as I can be. [emphasis added] And that's impeccability for me, but you have to choose what impeccability means for you. But let me tell you something. The Dream Team is gonna be up all night to support you. The battle may not be tomorrow. Oh. That's good because I have more time. I can get clean, more clean. But it's coming. It's coming. That's guaranteed. Once again, he's using a lot of tension building language and ramping up the intensity. But, what I found most startling is the statement I bolded above. Ray, himself, is tying together that idea of getting one's money's worth, as discussed here, with skipping sleep. So, he is actually putting out the idea that the way to get your money's worth is to do things his way and test the limits of the body. Now here's what else is gonna happen, is you're going to need support. You're gonna need help. You're gonna get into stuff that you don't know how to deal with. And, so, that's why the Dream Team is here. And when you go to talk to them, they may listen to you and send you off on a completely different tangent. Now here's how it works. The Dream Team is working shifts tonight. They literally will be up in, in, in what do they call it, not the mess hall, the dining hall, all night long. The lights will be on in there and there's water and there's drinks in there. And that's your space to work. And they'll be there, shifts all night long. And here's how it's gonna work. You're gonna go to them first. For as much time as you have to work between now and the battle, which I'm telling you, the battle is coming. Your battle, your Samurai battle is coming. You'll go to them first. If they feel like they need additional help, then we have two advanced support people which are Lisa and Megan. And so, the Dream Team will take you to Lisa and Megan if they feel like they need additional support. And if Lisa and Megan feel like they need additional support, they'll bring you to me. You see? You just can't all come to me because there's too many of you. And so that's why we've got a hierarchy here but I promise you, you will get the support you need. Are any of these people mental health professionals? I'm going to go out on a limb and say, no. As we're learning, the Dream Team, the unpaid volunteers, have no discernible training other than their past history of taking classes with Ray. Haley is a hair stylist, which I don't think qualifies her to address the issues that participants "will not be able to deal with." Who knows what cans of psychological worms could be opened up in conditions that intense, sleepless, and under-nourishing? All of this can leave people in a very raw, very vulnerable state. And they are far from home, with poor cell phone service (something else that came up in Haley's testimony) and no real means of emotional support other than Ray and his staff. In addition to the kind of long-term psychological harm that can do, it does something else that speaks to the prosecution's claims of creating cult-like dependency. Whether or not participants ultimately felt like that was what was happening to them, or if in fact they became ungrounded and opened up things they couldn't deal with emotionally, what we learn from this recording is that creating that very vulnerable state of mind was Ray's explicit intention. The all night support from the Dream Team did not go well for Haley and resulted in an altercation with Ray. While the volunteers were struggling to stay awake to support the sleepless volunteers, as per his instructions, Ray was sleeping. The female contingent of volunteers of which Haley was a part, amused themselves themselves with a bottle of wine and discussion. At a certain point, Ray came in and yelled at them for waking him up. Later he came back and excoriated them for drinking wine that evening, and for rustling papers and food wrappers while he was telling stories. Haley says that they were all angry and insulted as they discussed what had occurred for 45 minutes. They decided to get Ray from his room so that they could confront him and clear the air. Haley said their demeanor changed, though, when he came in and they began crying. Everyone, except for Haley, was apologizing to him instead of venting their anger. Haley did not back down and confronted Ray. He said, "If I'm gonna be attacked, I'm leaving." Haley responded, "No. I'm the one that's being attacked. I'm just defending myself." But the other women "jumped on" Haley and she "just shut up." Haley was left feeling like "an outcast" and "surprised." Liz Neuman left the altercation in tears. Interestingly, Dream Team members had been instructed to talk to Ray directly if they had issues with him. That's what Haley did but it did not go well. It's an interesting look into the dynamics of the organization and shows that a good number of the Dream Team members, many of whom had been Ray's students for years, were extremely deferential and could not confront or question him. Haley explained her perception of what the Spiritual Warrior sweat lodge was about. She described it as being a metaphor for pushing through discomfort and obstacles on your way to reaching your goals. This, of course, bears no resemblance to a traditional sweat lodge, as I've discussed ad nauseum. To this I will add another observation. While Ray reinvented the sweat lodge as a challenge and something to confront, a traditional sweat lodge is all about surrender to spirit. And this underscores, once again, why I have so much trouble with the mentality of The Secret. It's all about ego and force of will; not surrender or the dissolution of the ego. This is what always puts me fundamentally at odds with Rhonda Byrne, James Ray, and their ilk. So, having invested in this idea of the sweat lodge as a kind of proving ground and preparation for moving through obstacles on the way to her dreams, Haley found the 2007 sweat lodge, in which she participated, a very traumatizing event. I, um, stayed four rounds, felt like I was gonna die, came out, fell on the ground, got hosed off, started screaming, crying 'cause all my dreams, I felt, all my dreams weren't gonna come true. He then asked every round, did somebody wanna come back in so as they were putting hot rocks in, he called out "does anybody wanna come back in" and I screamed and cried and went back in for four more rounds 'til I had liquids just coming out of my nose. I could barely cry. I couldn't walk, so I crawled out, fell on the ground, got cooled off. And he asked if somebody else wanted to come in and the person hosing me said, "no," and I got up and I crawled back in and he said, "That's it," and he went four more rounds. Because I felt that I didn't succeed on pressing my threshold. He told us that we were gonna feel like we were gonna die and our skin was gonna feel like it was gonna come off but we were more than that. And so I felt all that stuff and I felt like I'd folded. The metaphor was things are gonna be hard when it is you're trying to fulfill your dreams and things are gonna get hard. So are you gonna persevere or you gonna fall out. She completed the sweat lodge, crawled out and was back up in no time, feeling "okay." So, according to Haley, Ray cut her off in terms of her "choice" to leave and return again. And she is a text-book example of someone who felt like to give up was to fail, not only the event or the seminar, but in terms of fulfilling her life's goals. Later, on cross, Truc Do tried six ways from Sunday to get Haley to say that she made her own choices and felt free to leave the sweat lodge. But Haley was having none of it. "No," she did not feel free to leave the sweat lodge when she wanted to. She felt like she had to wait until the end of the round, when the flap was opened. There was much more to the cross but I don't feel I can do it justice from watching it once on the live feed. I'm hoping they air it tomorrow on In Session. It got really heated. During the Samurai Game, Haley observed Kirby Brown's extreme discomfort and brought her an extra blanket. After she came out, she was in tears but couldn't speak because of the code of silence. Haley surmised that she had to go to the bathroom and told her to go ahead. But she was also pantomiming something else and Haley didn't know what she needed. Haley saw no one was watching so she indicated to Brown that she could go get what she needed and come back. Haley says that after the code of silence was lifted, she hugged her and expressed her gratitude to Haley for being kind to her. Polk played the much disputed tape of Brown sharing her experience of the Samurai Game and vision quest. It was decidedly bittersweet. Much of her sunny, optimistic personality came across as did her ability to transform a grueling experience into a powerful meditation and realization for herself. No doubt this is why Ray wanted the whole segment played. She shared that at a certain point her departed great uncle came to her and gave her what is personally some of my favorite advice: "Keep things simple." I don't know what was simple, though, about her experience. She shares her experience of extreme pain because of her full bladder, but not wanting to cost her teammates by getting up to go to the bathroom. She also shared that she had swallowed her own vomit to keep from moving. What all of this brings to mind is the early days of EST. Erhard and his organization took a lot of criticism for refusing to let people go to the bathroom when the program was in session. The practice was abandoned due to public scrutiny, and I'm assuming some internal reevaluation. Quite simply, it's cruel and abusive. There was also in depth questioning about the sweat lodge. Haley quickly came into conflict with the way things were run there as well. After the first round a woman came out and Haley started to hose her down. She was stopped by Marta Reis who told her it was too soon. So Haley waited until Marta turned away and proceeded to hose the woman down because she looked hot and miserable and Haley knew what it felt like. Why Marta was withholding cold water remains unclear. Haley also observed a disturbing exchange between Marta, Ray, and another participant who left the tent. Ray called her back, saying that her husband needed her. She started to go back in but stopped dead in her tracks when she got to the opening, and said, "No." Haley observed Marta holding the woman's arm and Ray continuing to cajole her to come back inside the tent. The woman held firm though and never went back inside. This, of course, does not comport with the defense's insistence that people were free to leave. Haley also observed Dennis Mehravar -- who is one of the people who filed a lawsuit against James Ray -- coming out of the tent violently ill. She testified that he vomited for 20-30 minutes, all over himself, the plastic tarp, and other people. At a certain point he started screaming "I don't want to die. I don't want to die." At a certain point Mehravar, who was afraid of having a heart attack, went limp and stopped breathing. Suddenly, and without assistance, he regained consciousness and said, "Am I dead?" When he realized he was alive he was ecstatic. Haley observed Ray calling to Mehravar from inside the lodge, "You're gonna be okay." But Ray never personally checked on him. Haley also saw Lou Caci's badly burned hand when he came out of the sweat lodge, having passed out into the heated rocks. She described the wound in his hand as being open so that she could see inside of it. Caci decided to return to the sweat lodge but Haley tried to talk him out of it because of his injury and because she didn't think he was in his right mind. When he proceeded toward the tent, she screamed, "Lou, you can't go back in. You're injured." At which point Marta Reis told her to "shut up" and "let him have his own experience." Letting people have their own experience was repeated guidance throughout this and other events and people were reminded to back off for that reason when they tried to intervene out of concern over someone's condition. One wonders how letting people have their own experience figured into Ray's decision-making when he was cajoling people who didn't want to go back in, like the woman whose husband needed her. Haley became concerned when Josh Fredrickson was dragged out because he was a veteran sweat lodge participant -- let alone one of Ray's chief lieutenants -- and she saw his distress as indicating that this sweat lodge must be unusually bad. Haley testified that the hose was not long enough, that there was not enough water, and there were many, many people in need of cooling off as the sweat lodge progressed. At the end of the sweat lodge, people were being dragged out all over and could not be reached by the hose. She tried to cool Liz Neuman with two cups of water because that was all she could get to where she was. Then, when she heard that she was breathing, and that other people were caring for, so she ran off to help the other people who had been discovered still in the tent.